''Oh, Chick...o-o-o-h-h-h, Chick!'" 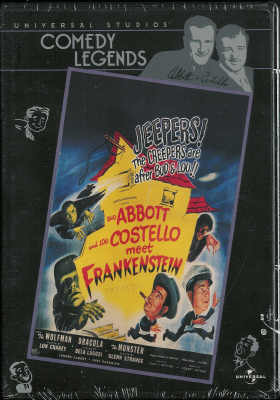 You'll know why Lou's screaming for Bud's help when you see the hilarious Abbott & Costello Meet Frankenstein. Out of print! This classic continues the "Meet the Monsters" horror-comedy series and features "the boys" with their usual quota of mayhem providing the backbone of the plot by becoming Count Dracula's victim for a brain transplant. Lon Chaney Jr. appears as the Wolf Man along with Dracula played by Bela Lugosi and Glenn Strange as Frankenstein's monster. Bonus materials include: theatrical trailer, Woody Woodpecker short and more. Important Note: Image shows a DVD but these are brand-new, sealed VHS videotapes.